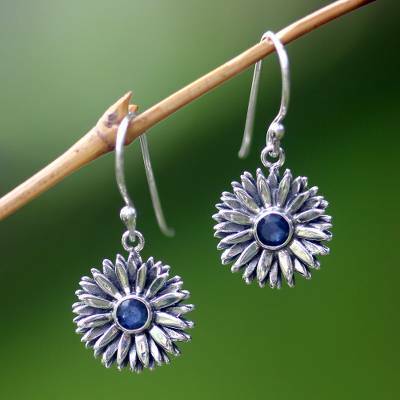 Nestled in sterling silver, faceted sapphires center these enchanting earrings. The aster is September's flower while sapphire is its birthstone. Nyoman Rena crafts the beautiful design by hand. You can find sapphire earrings 'September Aster' by Nyoman Rena in jewelry categories such as Floral Earrings, Birthstone Earrings, Sapphire Earrings, Silver Earrings, Sterling Silver Earrings and Dangle Earrings. Enjoy exploring these sections for other Novica treasures. I bought these earrings for my daughter and she loved them. She wears them frequently. I later ordered another pair for myself. I've found that you really can't go wrong with anything created by Nyoman Rena! I've made additional purchases from this talented artist since purchasing the sapphire earrings. The matching rings are beautiful as well! Very cute dainty earings, perfect for my daughter!!! "These are my "go to" earrings!" They match almost everything--I think the sapphires in mine are darker than in this photo. I'm very pleased with them. "Aster earrings with sapphire center"
I gave these to my sister for her birthday. She loved them! They are very pretty and well made. Fantastic earrings although the stone seems a bit dark but I love the flower design. These are a keeper. "Smaller than expected but beautiful"
Very pretty earrings. A little smaller than I expected. Very well made - I don't worry about something happening to the earrings if I need to put them in my purse for some reason. The earrings are beautiful and very detailed silver work. The pedals of the flowers are 3D. They are a perfect size for an adult or young woman. The picture shows the sapphire a bright blue but in reality they were very dark . I am sure my gift will be loved and cherished for years. "A delicate flower to make your ears bloom :)"
These earrings were a gift. She loves them! They were just what I expected.